Jedrei over at outlookforums.com wanted to send all of the files in a folder as email attachments, one attachment per message. 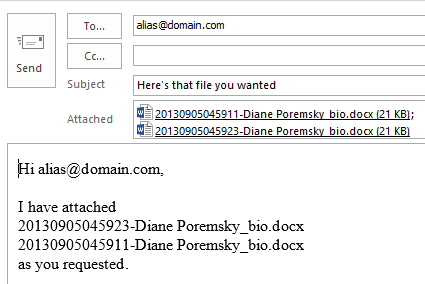 The following macro attaches one file to an email message and sends it, then sends the next file in the folder, repeating until all files are sent. "Embed Images in New Messages using a Macro"
When it's finished, a dialog box tells you how many files were sent. It also lists the file names in the Immediate window, if you want to review and confirm each file was processed and sent. To use this macro, open the VBA editor, add a new module and paste the code into it. Change fldName to use the correct path then run the macro. If you need a record of the files sent, press Ctrl+G to open the Immediate window in the VBA Editor to view the list created by Debug.Print fName. MsgBox i & " files were sent"
.Subject = "Here's that file you wanted"
.HTMLBody = "Hi " & olMsg.To & ", <br /><br /> I have attached " & fName & " as you requested." When you want to send all attachments that are in a folder, you'll need to loop through the attachments in the function to add them to one message. The following example offers two options: add all items in the folder or add only certain file types to the message. .HTMLBody = "Hi " & olMsg.To & ", <br /><br /> I have attached <br /> " & sAttName & "as you requested." When you want to include only attachments with filenames that begin with certain characters, you'll need to filter the filenames using an If statement. In this screenshot, I'm including only attachments that begin with "2013". You'll need to run the macro for each prefix. If you routinely send the same series of attachments, for example, files are prefixed with 100, 200, and 300, with each prefix in one message, you can use an array. I have an example in this text file. This macro is a variation of the macro at Create a New Message using an HTML File or Stationery and attaches the newer files in the folder to individual messages. This uses late binding to call the FileScripting object so we can avoid setting a reference to the scripting object model. Just another macro to send all files in a folder in individual messages. Hello , thanks for sharing. How can I change method ; I want to give Attahcment name or title as Subject. How can I add subject for per e-mails? I tried "Subject = = Attachment.DisplayName" but it could not work, I think syntax error I have. This should work, since we already have the attachment name in a variable. to get the display name from the attachment you need go through the attachment collection. Please I need your support , I send many emails and when email have issue the sending was stopped can I get any way to continues send emails without stopped and after send all emails get report or list (sheet 2 in the same excel od sending bills ) of the emails that have issue to send it again. yes,when some emails have issue. What is the error message? If the problem is related to the send speed, you'll likely need more complicated vba, which I don't have. there are a couple of 3rd party programs that can control the send speed. add a debug.print .To after you've set the To field then check the immediate window to configure its in the correct format - single quotes or other goofiness In the name format can prevent it from recognizing the name. Is there a possibility to have a VBA code that will send notification for both fails and successes emails in a report or list without stopped the sequence of emails where any email have issue. It may be possible, but I don't have any ideas offhand on how to do it. Are the failure NDRS that bounced back? so you need to slow it down so you send 100 per hour? You can set a delay delivery time - its difficult to get it to 100 per hour, but 60 per hour is easy. Thanks dear ,but for this code (CurrentTime = DateAdd("n", 90, Now) ) what do you mean by "n" and 90, and does i need to define the "n" in the script and where ? and i get error when i put the code ( DeferredDeliveryTime = DateAdd("n", delay, currenttime). Oh, sorry, 90 is a typo - it should be 1 - I copied it and forgot to edit it. That sets the time to be a minute from now. CurrentTime = DateAdd("n", 1, Now). Actually, that's not right either. We just want current time to be 'now' then will add 1 min to it with each message. ok for this code (CurrentTime = DateAdd("n", 90, Now) ) but when i send all emails that i have, it was send all of the emails without divided it for 100 emails per one hour . That is not right. It delays all mail for 90 minutes. :( The macro version I just posted will send 1 per minute - sending 100 per hour all at once will require counting the messages and changing the delay delivery time every 60 min. but also need to wrap it in a count - when it gets to 100, add 60 to the delay. Thanks dear for your support i use the code (.DeferredDeliveryTime = DateAdd("s", Delay, currenttime)) and Delay = Delay + 30 ,that send 1 email per 30 second that mean its send 120 email per1 hour . sAttName = fName & "
.Subject = "Here are the Daily Orders Reports"
Attached are the Daily Orders Reports for your review." All the new files in the folder attached as one email. I'm guessing it might be the network path - outlook can be fussy about working with network folders. Test it with a local path and see if it works. And still only opens the email with the message but no attachments. I also can't figure out how to modify it to only send the most recent / the latest modified dated files on the same date. I tried with C:\Reports and still only has the email content but no attachments. Do you want to add all files in the folder or just ones newer than a certain date? Using the last mod date, the macro will only send the newest file. If you want to send several with recent dates, you'll need to tell the macro - if its always everything less than a day old (or some set value), it can be hard coded in the macro otjherwise you'll need to either enter a date, date & time or a number (for days ago) in a input box so outlook can use that date. Oh geez! it's the "\" at the end of the path after Email. Looking good! Thank you so much! Now how to send the reports with the .DateLastModified as the most recent ones or all reports with .DateLastModified date for today only? And how to launch the macro from Windows Task Scheduler to auto run it on a schedule? launching it directly from the task scheduler is impossible - you'd need to convert it to a vbscript. Or, if outlook is closed, task scheduler could start it and and a startup macro can trigger... but if outlook is open, you can trigger it from a task or appointment reminder. This is great! I got the Attache New Files to work. Thank you! I want to attach ALL NEW files and although I tried to move things around from the codes provided, I am unsuccessful at getting it correct. How do I combine attach new files with attach all files as one email? Would like to send ALL the NEW files as one email instead of one file per email. how to add the signature in this VBA? Hi Dianne, Thanks for the code, but I'm having a little difficulty with it. I am using the first code you wrote to email multiple files in one location using multiple emails. When I run the code I get a message that says "0 files sent" even thought I have multiple files in the location specified. I saw your message below to Dustin about this same issue. I tried to make the changes you suggested, but still get the same message and no files sent. Any ideas? change the debug.print line to debug.print fldName & fName then press Ctr+G to show the Immediate window at the bottom of te VBA editor. Run the macro. Is the path listed in the immediate window correct? Instead of using debug.print, you could use msgbox, but test it with a few files only - it gets real annoying, real fast.